Happy Waif Wednesday! Meet our amazing Waifs of the Week: Tim, Miles, and Buster. These three guys can’t wait to find their forever families! Hi peeps! Tim here! I’m a happy, friendly boy who loves to play, and I’m just waiting for my new playmate to come along and take me home. Pleased to meet you! My name is Miles, and I’m a handsome buff and white shorthaired boy. I came to Wayside from another shelter that was low on space. I’m a confident, friendly boy. I enjoy being petted on my chin, neck, head and cheeks. However, I can get overstimulated. So I ask that you please go slowly with me, petting me a couple of times and then giving me a break. I love people and attention, but sometimes I’m just so happy to have human companionship, I get a little too excited about it. If you visit me and talk with me, I might give you a little kitty kiss on the hand. I like to play, too, especially with my toy mouse. Hey there, I’m Buster! I’m a sweet 4-year-old fella in search of my forever family. My friends here at Wayside say I’m one of the best leash-walkers they’ve ever met. Seriously! I love going on walks, so I’ve had lots of practice. I barely ever pull at all. I’m pretty smart, but I’m still working on commands. My friends are helping me with that, and I think some basic obedience training would be great for both of us. I’m very food motivated, so a few extra treats here and there wouldn’t hurt! I like making friends, but sometimes I get a little nervous. I like pets and snuggles, but only on my own terms. Just give me some time to sniff you out, and I know we’ll be besties for life! I do request that you bring the whole family, including dogs, to meet me before bringing me home. I just want to make sure we can all be buddies. Happy Waif Wednesday! We’d like to introduce you to our wonderful Waifs of the Week: Bailey Bagel, Sampson, and Conner. One of our original Waifs of the Week, Jesse, went home, so Sampson is taking her place. These three love bugs are so ready to find their families! Hi there, I’m Bailey Bagel! I’m a sweet one-year-old pup ready for my forever home! My friends say that I’m a great girl––super smart and sweet. I love to be in the middle of the fun and don’t miss a beat. I’ve had the chance to spend some time in a foster home where we’ve learned all sorts of awesome things about me! I know “sit,” “down,” “drop it,” “hup” (for jumping up on things) and a few others. I would love to learn more and will pick up new commands quickly. I’m very happy to be active and playful with my foster family and then snooze on the couch for a few hours. I also like to watch TV and snuggle! And guess what? I’m also housebroken! I can play well with other dogs, but I also know how to entertain myself. Come and meet me today! Hi there, I’m Sampson! 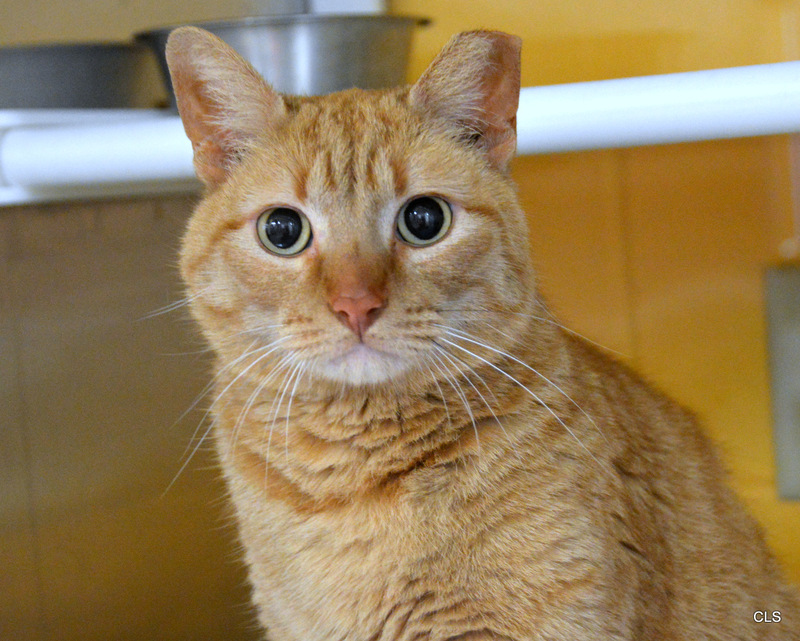 I’m a mellow three-year-old guy ready to find my forever home. My friends here call me a Personal Assistant. This means that I’ll always be by your side, ready to help you out with any tasks. I’ll read and watch TV with you, but my favorite activity is relaxing. Toys aren’t really my thing, but I do like an orderly household, so if they’re around, they’ll never leave my sight. I’m affectionate and easy-going, so I’ll always let you know how much I love you. I’m a healthy guy, but I do have something called FIV. It’s no big deal––I can live a totally normal cat life! It’s just important that I only live inside and have regular vet check-ups, but that’s something you would do for any cat. Hi there! My name’s Conner, and I’m so happy you stopped to read about me! I’m a friendly boy who just loves people so much. Do you like giving pets? Then, you’re in luck, ’cause I like getting them! I’m hoping to find a home that can give me lots of attention and exercise––I love, love, LOVE playing! I think it would be so cool to go to training together. I like treats, and I’m super eager to learn commands like “sit,” “come,” and all kinds of other doggie manners. Would you like to take the time to teach me? In return, I promise I’ll love you with everything I’ve got! Oooh I hope you come to meet me soon! And if you’ve got other pooches at home, be sure to bring them along too. I just want to make sure we all get along great. Happy Waif Wednesday! Meet our lovable Waifs of the Week: Pablo, Winston, and Leroy. One of our original Waifs of the Week, Sampson, went home, so Winston has stepped up to the plate. These sweet boys are so excited to find their forever homes! Hi! My name is Pablo and I’m a handsome fella waiting for my forever family. I’m a little shy when I first meet someone but I warm up quickly. We’ll be best friends in no time! I don’t know any commands yet, but I like treats and I’m sure we can work together to learn new things. My friends at Wayside say that I do well on a leash. Let’s gear up and go explore the world together! I’m up for anything as long as I’m with you. After we exercise, I’d love to curl up right by your side. I’ll even let you pick what show we watch! I like to play with other dogs, so if you’ve got a canine friend at home, we might be a good fit. You’re welcome to bring them with you to meet me and we can get to know each other before heading home. I know it won’t take long to find my special people. Could it be you? Hey there! Thanks for reading about me! My name is Winston, and I’m just about the sweetest, mellowest guy you could ever meet. I’m a big, white cat with just a little gray on the top of my head. And I have beautiful, exquisitely lined pear green eyes. I am also front-declawed. I guess you could describe me as a big, fluffy cloud. Or a sweet, pillowy marshmallow. I’m a friendly fellow who loves attention and affection, but I like to let you make the first move. Once you start petting me, I won’t want you to stop. At 7 years of age, I’m right in the prime of my life. I know what’s most important: giving and receiving love. Do you think we could do that for each other? Hi there, my name is Leroy! I am a 1-year-old lab/retriever mix. I came in very shy and unsure of what was happening. Then I started Confidence College, and that’s where I met some really nice friends. It takes me some time to warm up to new people, so just let me come to you when I’m comfortable. They say I am really getting better at warming up to people! I have also done some clicker training, learned how to target a hand, and know the “look” command, where I look into your eyes and focus on you. I am really good at these and would love to learn many more things with you! I enjoy being in doggy playgroups, and I’ve gotten really good at making friends. Please come meet me in person soon! Happy Waif Wednesday! Meet our incredible Waifs of the Week: Carlie, Hamlet, and Beau. These three kiddos can’t wait to find their forever families! Pleased to meet you! My name is Carlie and I’m sweet one-year-old gal looking for my forever home. Moving around and being the new pup in town is scary, but I’m keeping my head held high. I know it won’t be long until I find my forever home! I’m a sweet girl and I love life! I don’t know any commands yet, but I’m hoping to find a family who will help me learn. I’m sure if you throw a few toys and treats my way we can learn in no time. I also like to explore, and I do pretty well on a leash. I’d love to check out the neighborhood or maybe a dog park! If you’re looking for a sweet best friend to go through life with, look no further! Come to Wayside and ask to meet me! Pleased to meet you! My name is Hamlet, like the lead character in one of Shakespeare’s most famous plays. That’s quite a moniker for a quiet, unassuming guy like me. I’m pretty shy and timid at times, so if you come to Wayside to meet me, I might be hiding under my bed. Please don’t let that stop you from saying hello, though! If you speak to me softly and pet me gently, I will warm up pretty quickly. Before you know it, I will be purring and rubbing my handsome orange face against your hand! I will probably never be one of the bravest cats in the world, but I’m definitely one of the sweetest. Take me home, and I will reward you with a lifetime of love and loyalty. I’ve never seen “Hamlet,” by the way. But I know my own play will have a happy ending, so come to Wayside and ask to meet me! Hi! My name is Beau, and I’m a handsome fella ready for my forever home. I’m about two years old and I’ve got gorgeous black and white fur. Moving from shelter to shelter has been scary but everyone here is so nice. I know it won’t be long until I find my very own family. My friends here say that I’m one of the friendliest dogs they’ve ever known! I’m also pretty smart. I know “sit,” and I’m eager to learn more commands and tricks. If you throw some treats my way, we’ll learn in no time! I’m a curious dude, and I like to meet new people. I do pretty well on a leash, and I love being outdoors. Maybe we could go for a stroll around the park together? Walks are my favorite! I do request that you bring the whole family, including dogs, to meet me. I just want to make sure we’re a good match before we head home. I can’t wait to meet you so we can start our lives together!